My family recently visited Boston on vacation. The whole family was impressed with the Museum of Science, so much so that we visited twice during our week in the city. I guess it's no surprise that the facility is such high quality, given the number of top-flight universities and the long history of tech in the area. In an alcove across from a window overlooking the Charles River, a landscape is projected onto a table with tactile objects surrounding a flowing digital river. Starting on the left, a kayaker floats down the river between houses that need electricity. Visitors can install different-sized hydroelectric dams – like the one the museum sits atop – using boards with magnets that trigger the river to react in corresponding measure. The kayaker bumps into the dam with a “bonk” sound and gets stuck, and fish get trapped on either side, but the houses light up. At stations downstream, visitors make decisions about pest management of crops, fish passages, land use and even a sewer system. If the board is chosen that dumps raw sewage into the river, the water there changes from blue to putrid, boaters are turned away and fish die. But if there’s no sewer system, the toilets in the house at that station – physical structures that can be touched – back up with projected sewage that spills onto the bathroom floor. Visitors are encouraged to explore what happens depending on whether the economy, the environment or recreation are valued highest. 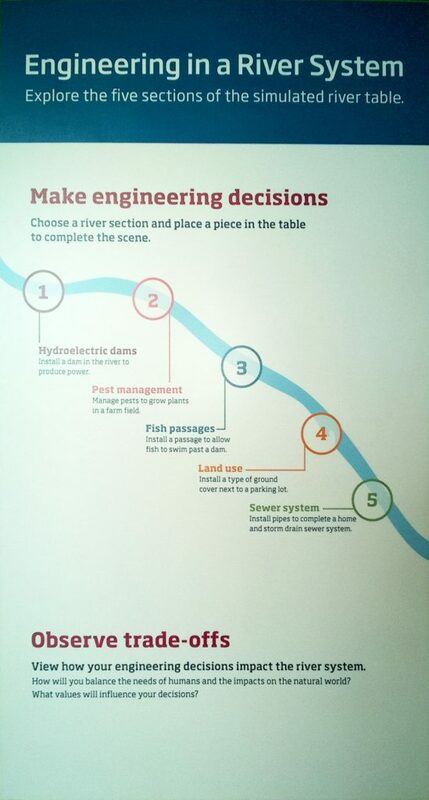 The jury was impressed with the combination of technology and interactivity in the Engineering in a River System interactive. The projection mapping worked very well and the use of a contoured physical table and tactile engineering pieces was very effective. The jury also commended the fact that the interactive was open-ended, collaborative and designed to inspire discussion rather than achieving a 'correct' answer. This interactive is an excellent example of using technology to provide innovative ways for visitors to learn through experiences. Congratulations on a project well realized. Exactly so. Curiosity is sparked and sustained with there is the right amount of complexity to wrestle with and when it's clear the learner is not being spoon-fed an over-simplified answer or a view colored by a particular agenda. A motto might be "embrace the gray." Congrats to MoS and to the Microsoft team that advised them. Job well done! ← What is the point of going to a store? Lovely piece. I live in Cambridge so it’s especially relevant for me; putting this exhibit on my to-do list.